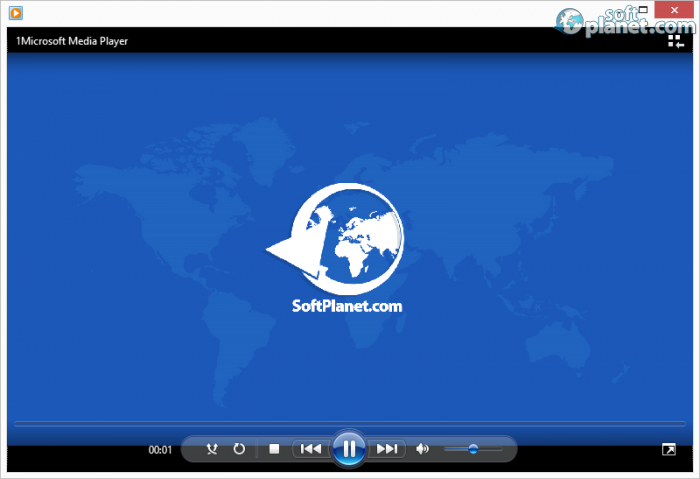 SoftPlanet makes it possible for everyone to get free Windows Media Player download directly from our servers. There is no registration needed for downloading. The integrated media player in the Windows operating systems has gone through a lot of transformations with the advancement of Microsoft Windows. Some of them were in the wrong direction and others were a great improvement to this video and audio player. The latest version of Windows Media Player can be described as an excellent improvement, because it has fixed a lot of the issues the older versions had and at the same time it offers compatibility like no other media player. This version is also much more user friendly but it gives some options that are old but still deserve to be mentioned. 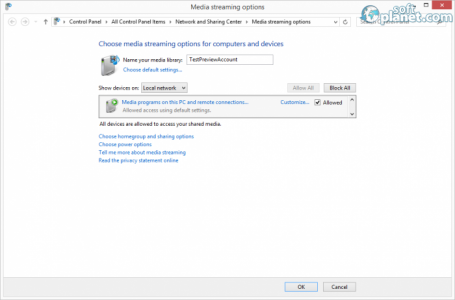 There are other things which you can use Windows Media Player for and these features have been a part of the program for a long time. First you can burn an audio CD by dragging files to the Burn tab. You can also sync different devices and, not in last place, you can organize your media. Microsoft has put a lot of effort into the playlists and organization, since the Organize and Create playlist tabs are a part of the main window. Also you have separate panes for music, videos, pictures and playlists on the main screen. After you create your lists of files you can view a lot of information about them, like for example Album, Title, Length, Rating, Contributing artist, Size and Parental rating for the music and also Release year, Genre and Actors for your movies. There is a problem that we found for all the new versions of Windows Media Player – it is a bit hard to move from the video to the playlist and back, because when you start a video or an audio file the playlist closes. After you start the file there is a small button in the top right corner where you can return to the playlist, but then it closes the player. Still, after you get used to the interface of the app you will find it quite user friendly and you'll be able to organize your media with ease. 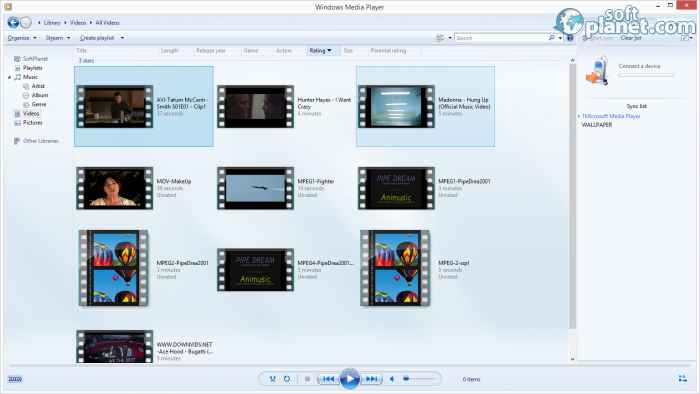 The best feature of Microsoft Media Player is that it can play an enormous number of formats, which makes it one of the most compatible audio and video players. The program can work with 3G2, 3GP, 3GPP2, 3GPP, ACC, ADTS. AIFF, ASF, ASX, AU, AVI, CDA, M1V, M2T, MTS, M2V, M3U, M4A, M4V, MID, MIDI, MOD, MOV, MP2, MP2V, MP3, MP4, MP4V, MPA, MPE, MPEG, MPG, MPV2, MTS, RMI, SND, TS, TTS, WAV, WAX, WM, WMA, WMD, WMS, WMV, WMX, WMZ, WPL, WVX files. We listed all of these formats so that you can view them and download this app if you want to use a specific audio or video format. There were times when the first thing that you did, right after installing any Windows operating system version, was to add another player. But these times are history because the integrated Windows Media Player 12 offers enough to replace the need of any other program for playing audio and video. 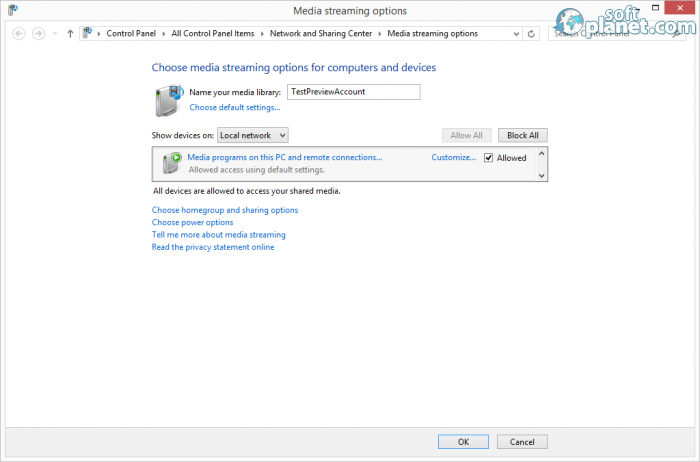 The program as always is compatible with many files, but now it is also user friendly, informative and can help you to organize your media and play or stream anything you want. Windows Media Player is VIRUS-FREE! Our security scan shows that Windows Media Player is clean from viruses. The current version of Windows Media Player has been scanned by our system, which contains 46 different anti-virus algorithms. 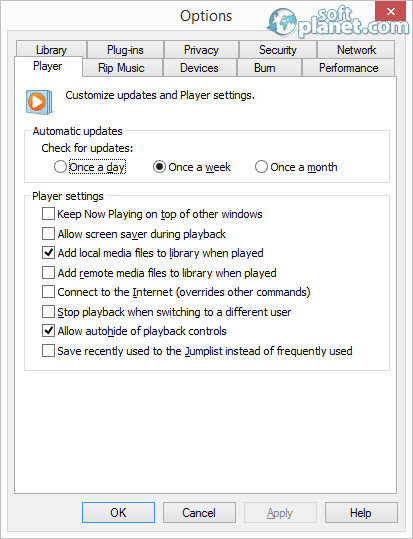 That ensures that Windows Media Player 12.0.9431.0 is 100% safe for your computer.